Having sensitive skin makes finding the perfect sunscreen a challenge. You want a formula that doesn’t make your skin react and that feels nice too. Don’t fret. We’re sharing what you need to know about SPF ingredients so you can easily find the best sunscreens for sensitive skin. Mineral sunscreens (often called “physical sunscreens”) list titanium dioxide and/or zinc oxide as their only active ingredients. Both are incredibly gentle ingredients known to be well suited for sensitive skin. They absorb into the very surface layers of skin where they deflect, scatter, and absorb the sun’s harmful rays. In the past, mineral sunscreen formulas were thick and noticeably opaque, which is why it was tricky to find one that looked and felt good. CALM Redness Relief SPF 30 Mineral Moisturizer for Normal to Dry Skin (hydrating, cushiony texture + soothing plant extracts). CALM Redness Relief SPF 30 Mineral Moisturizer for Normal to Oily Skin (lightweight, skin-calming formula with a non-greasy feel and shine-free finish). RESIST Super-Light Wrinkle Defense SPF 30 (the best tinted moisturizer with SPF for sensitive skin). 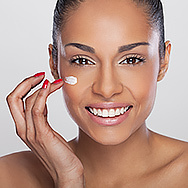 Synthetic sunscreens (often called “chemical sunscreens”) also scatter and deflect the sun’s harmful rays, but they work primarily by converting UV rays into heat and “deactivating” them before they can damage your skin. Common synthetic sunscreen ingredients include oxybenzone, octinoxate, octisalate, and avobenzone. It's easier to achieve a lighter-weight feel and imperceptible (no white cast) finish with this type of sunscreen, which is part of the reason they are widely used in SPF products. However, synthetic actives also can trigger sensitizing reactions for some people, which is why we (and dermatologists around the world) recommend mineral sunscreens for sensitive skin. To be clear, synthetic sunscreens are great and many people can use them—they’re just generally not the best bet for sensitive or redness-prone skin. One other important thing to note: Fragrant ingredients are often used to mask the natural smell of sunscreen actives, but that’s bad news for all skin types, especially very sensitive skin. Fragrance ingredients impart their scent through a volatile reaction, which almost always causes a sensitizing reaction on skin (whether or not you can see it, it’s happening). In fact, research has established that fragrance in skincare products is among the most common cause of negative skin reactions. All Paula’s Choice Skincare products, including our moisturizers with sunscreen, are fragrance free—something we standby unequivocally.